Addiction Medicine is currently not recognized by the American Board of Medical Specialties (ABMS). It is still a a Self-Designated Practice Specialty and the American Board of Addiction Medicine is a Self-Designated Board. So too is the American Academy of Ringside Medicine and Surgery, the American Academy of Bloodless Medicine and Surgery and the Council of Non-Board Certified Physicians. But these Self-Designated Boards do not have the multi-billion dollar drug and alcohol testing and treatment industry supporting them. 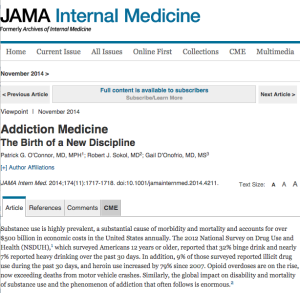 Addiction Medicine has deep pockets, and if the November 2014 issue of the Journal of the American Medical Association (JAMA) is a harbinger of what’s to come, this self-designated practice specialty currently being certified by a self-designated Board and bereft of anything resembling the educational and professional standards for quality practice in a particular medical specialty or subspecialty as defined by the ABMS, the American Council on Graduate Medical Education (ACGME) and the Institute of Medicine (IOM) may soon robber baron its way into acceptance by the Medical Profession. One thing is for certain. When society gives power of diagnosis and treatment to individuals within a group schooled in just one uncompromising model of addiction with the majority attributing their very own sobriety to that model, they will exercise that power to diagnose and treat anyone and everyone according to that model. The birth of Addiction Medicine as an ABMS accepted discipline is sure to be a success for the drug and alcohol testing and 12-step treatment industry, but its spawn is sure to be an inauspicious mark on the Profession and Guild of Medicine and a bane of society for years to come. via Disrupted Physician 101.2: “Addiction Medicine” is a Self-Designated Practice Specialty Unrecognized by the American Board of Medical Specialties–(An AMA Census Term Indicating Neither Training nor Competence). Addiction Medicine is currently not recognized by the American Board of Medical Specialties (ABMS). It is still a a Self-Designated Practice Specialty and the American Board of Addiction Medicine is a Self-Designated Board. So too is the American Academy of Ringside Medicine and Surgery, the American Academy of Bloodless Medicine and Surgery and the Council of Non-Board Certified Physicians. But these Self-Designated Boards do not have the multi-billion dollar drug and alcohol testing and treatment industry supporting them.